Let’s get this straight to start with; I’m not writing this to gloat about Tottenham’s defeat last night. It’s always nice to see them beaten emphatically but it doesn’t take away from the fact that we went out in the last round, albeit to the world’s best team. I’m writing this to try to get some perspective on a difficult time to be a Gooner. None of us like seeing Arsenal balk at the final hurdle; especially when we seem to be so close to shaking of this trophy hoodoo. I want us to win a trophy as much as the next man but we should remember that disappointment at failing to win the Champions League after 13 straight years of qualification is quite a privileged brand of disappointment to have to live with. Let’s take that lot up the road as a case study. This is the first time they’ve ever been in the Champions League. They’ve enjoyed the journey which came about after last season’s 4th place finish; their highest in the Premier League era. Redknapp’s side looks likely to fall short of repeating that feat this year as City and Chelsea consolidate the 3rd and 4th spots. Tottenham have consistently spent more than we have for years now but their cumulative performance is considerably less impressive. 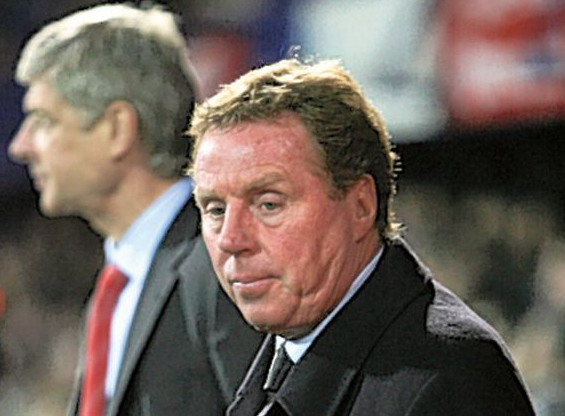 OK, two years ago they were floundering at the bottom of the table – off the back of more significant expenditure I might add – until ‘arry rode in and saved the day. The turn around has been impressive, even to a Gooner. That turnaround would be enjoyable if you were a Tottenham fan but it’s not cause to hire an open-top bus. The fact is that we’ve never needed a turnaround under Wenger; we have been competitive and successful in qualifying for the latter stages of the Champions League for years now. We, along with Madrid, maintain the best record of getting beyond the group stage, 11 consecutive seasons. Better than Barca, Milan, United, Chelsea, even Tottenham. On top of this – and I know it’s an irritant to some fans – we’ve built a state of the art stadium that, although it isn’t Highbury (Oh how I miss her), we can all be proud of. Our transfer policy was designed to stabilise the club in a period of great upheaval. We’ve done that. Tottenham are so desperate for a new ground they are prepared to take the Olympic Legacy group to court to fight for a move to Stratford. Stratford!?! There is no way they will be able to finance a stadium move and keep spending as shown above. For some Tottenham fans, it might be a blessing that they can’t carry on spending like that with no tangible reward. More recently, Arsenal and Tottenham have similar records over the last few league games. We’ve had three draws in three games; they’ve got three points from four games against the bottom four. We’re out of the Champions League and so, very nearly, are they. However, we will qualify for next year’s Champions League whilst they will most likely be back on Channel 5. Yet, it’s our fans who are calling for the bosses head. I’m not saying I’m happy at failing to win but let’s just realise how lucky we are. We might have a bare trophy cabinet but we’ve done all the groundwork to expand now and this barren spell won’t go on forever. Whilst Tottenham fans look back on those special nights against the Milan clubs, longing for another crack at the big-time we shouldn’t forget that we are the big-time. We may not have won anything recently but please be at least a little bit thankful for the fact that you support one of Europe’s big sides. It’s the fact that we are close to greatness that makes failure disappointing but let’s remember that our failure is better than almost everyone else’s success. Keep the faith, In Wenger we trust. I think sacking wenger will be de worst ever mistake in de history of arsenal. IN ARSENE WE TRUST. But imagine what we could do and how far we could go if we just invested in a few world class quality players. That is all fans are asking for and it’s the lack of investment in the squad that is getting to us the most. @Danielle Totally agree but the inflated Market definitely put Wenger off in the summer and in Jan. Held to ransom for Jagielka, Reina and Cahill for example. Back-up players have let Arsenal down so expect a fair few of the likes of Rosicky, Eboue, Denilson etc to move on with Lansbury, Frimpong, Miyachi to come in, plus a few new faces. It’s frustrating but we need to get behind the team, then reassess in the summer. This Wenger out nonsense and booing the team is ridiculous when you look at the big picture. There is no doubt that Arsene Wenger will not be sacked by any well meaning director. Yes, a few fans may be calling for his neck but those same fans will be the first to get to the emirates stadium everyweekend to get a glimpse of the beautiful football which has come to characterise the Arsene wenger’s side. Very soon Arsenal will come good and start to win things. People seem to forget that for about six years, Barcelona won nothing but they were busy building the dynasty they have now.Barcelona are leaving beyond their means as indicated while arsenal is doing business the way it should be done. In Arsene we trust.